Jose Mourinho slammed his Manchester United stars after they conceded a late equaliser in a 2-2 draw against 10-man Leicester that left them 13 points adrift of leaders Manchester City. United were already trailing in City’s wake, but Harry Maguire’s 94th-minute leveller at the King Power Stadium on Saturday was another hammer blow to their title hopes just hours after their rivals had beaten Bournemouth. 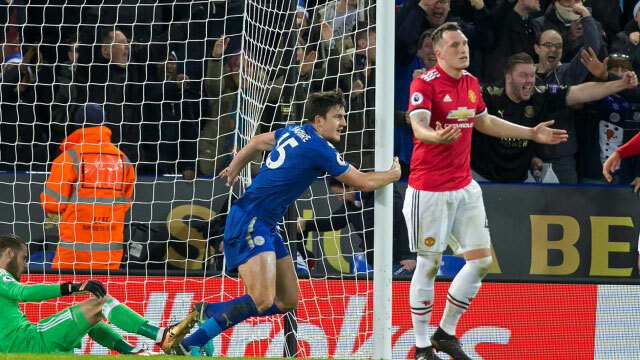 Mourinho’s side had missed several superb chances to move 3-1 ahead and effectively kill off Leicester and the United boss was furious with his players’ finishing and the sloppy way they allowed Maguire to equalise. “It is as bad as a defeat,” said Mourinho. “Sometimes you take a point and you say ‘OK’ and you accept it as it was hard to get a positive result. “That is not the case. It is a game to win easily. It is a big frustration as they are easy goals to score and easy goals to kill the game but not just the goals we missed, also some easy way out to counter-attack where we lost the ball quite easily. “On top of that, in the last couple of minutes, we allow the opposition to throw a few balls into the box, with Christian Fuchs’ hands and crosses. “We couldn’t defend the last cross so I think we were punished by our mistakes in both penalty areas. “There was a lack of maturity. I cannot stop the game and give a team talk,” said Mourinho. “For the last two minutes the players had to immediately adapt, to read the game, which they didn’t so we had childish decisions in front of goal and bad decisions as it was not just about the goals we missed, or dribbling or hitting the post.